Help the Institute continue to provide books, journals, analysis, and updated content on Palestinian affairs and the Arab-Israeli conflict. All donations are tax deductable in the United States. 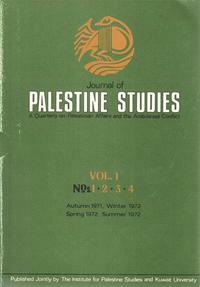 This December, the IPS Special Focus includes free articles from the Journal of Palestine Studies focusing on the Arab-Israeli conflict's effect on academia. Poster image from Walid Khalidi's seminal work, Before Their Diaspora: A Photographic History of the Palestinians 1876-1948. November 2nd marked the 97th anniversary of the 1917 Balfour Declaration declaring “His Majesty's Government view with favour the establishment in Palestine of a national home for the Jewish people” in a letter from U.K. Foreign Secretary Arthur James Balfour to British Zionist partisan Lionel Walter Rothschild. This November's Special Focus covers Balfour, British imperial policy in Palestine and its effects on the Palestinian people. An interview with Dan Walsh of the Palestine Poster Project Archives, which recently had it's "Liberation Graphics" collection nominated to the 2014-15 UNESCO Memory of the World program. J. M. N. Jeffries, formerly a war correspondent in Europe and the Middle East, working for Britain’s largest-selling newspaper, the Daily Mail, was sent to Palestine in 1922 by its owner, Lord Northcliffe, to report on its developing political and economic affairs—just five years on from the Balfour Declaration and its promise of British support for the establishment in Palestine of a Jewish national home. 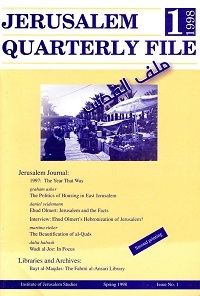 Articles, essays, and reports from past issues of the Journal focusing on Palestinian prisoners.